Will it be worth salvaging and selling the canola left out in your field this winter? 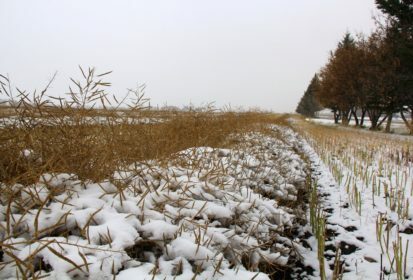 Many growers across the Prairies are facing the reality of canola that’s been left out in fields over winter. Over the past few weeks, I’ve been talking to players in the canola buying and processing industry to find out who will buy spring-threshed canola, and to learn about some of their concerns. Reps from the major grain companies were all consistent, saying that they will be open to buying spring-threshed canola if the quality is there. What does that mean? When it comes to grading canola it’s fairly easy to determine quality by rolling and counting a number of 100-seed crush strips. Determining the number of green, damaged or sprouted seeds will quickly establish a grade. It becomes more complicated when you have to consider factors such as excreta, mould, mildew or heated seeds, and the odour that may be present because of these factors. All of these factors can affect the quality of end products — both the oil or meal — making the products unsaleable into many end use markets. Tolerance for these grading issues is very tight. Grain companies are prepared to buy some spring-threshed canola because they will need to blend it into the rest of the canola they are shipping. The severity of the degrading factors will determine how much or how little they can blend into the rest of the canola they’re shipping and remain within export grade specifications. If the quality of the spring-threshed canola is poor, they won’t be able to blend as much of it away as they may like, limiting the amount they’ll be willing to buy and the price they’ll be willing to pay. Another consistent comment was that they will need to see good representative samples before they will commit to buying anything, and purchases will be on a load-by-load basis, meaning if a load does not closely match the representative sample or if they don’t like the quality of a particular load, they will reject it. As for price, no one will quote a price until they see the actual unload grade. Then, they’ll have to confirm the price with the head offices — it could be a moving target every day. I suspect there will be a lot of variance in prices between companies, and from day to day at each facility, while they try to figure out how much they are willing to buy. I connected to buyers from four of the major crush facilities across the Prairies, and their message was consistent. They are not interested in buying spring-threshed canola! Their main concern is the risk that blending damaged or low-quality spring-threshed canola into their stocks could taint or contaminate their oil or meal. World oil markets are very competitive and losing a customer over tainted oil is too big a risk, for very little reward or gain. One crusher said that even if they got spring-threshed canola for free it wouldn’t be worth the risk. Milligan Bio Fuels in Foam Lake, Sask., told me that they will require very good representative samples for testing before they will commit to taking any spring-threshed canola. There are a few things that they will be looking for, one of which is excreta in the canola. Depending on the severity and the size of the excreta they can remove some or maybe all of it through aspiration when cleaning, but if there is too much they may reject the load. They will be testing for Free Fatty Acids (FFAs). FFA’s impact the quality of the oil that is produced, which is a real concern to the end use customer. The percentage of FFAs is higher in sprouted and damaged canola. On average, according to the Canadian Canola Growers Association, FFA levels in Canadian No. 1 canola average around 0.20 per cent. On sprouted seed, FFA levels can be higher than one per cent. FFA in canola can also be high if temperatures are high during the growing season. Milligan Bio Fuels only needs a 300 gram sample to do a proper FFA analysis. They encourage producers to go out and hand thresh a sample now and send it in to see if you have a product they are interested in buying. You can send samples to Milligan Bio Fuels, Box 130, Foam Lake, Sask., S0A 1A0. The Canadian Grain Commission is doing a survey of spring-harvested canola. They would like producers to send samples of spring-thresed canola as well as samples that were harvested last fall so they can do some comparative analysis to see the difference in quality. I believe (but was unable to verify) they will do a FFA analysis as well so this would be another avenue for producers to be able to get an idea as to the quality of their canola. Contact Twila at the CGC at 1-204-983-2289 to receive sample envelopes. My best suggestion is to go out now and hand thresh some samples from different fields and send them either Milligan Bio Fuels or the CGC for an FFA test so you have an idea of the quality of the canola you will be taking off this spring. That will help you determine what your marketing option(s) might be. Then, you can decide whether your canola is worth salvaging or not and make plans accordingly. You’ll have limited time this spring to take it off and then get the ground seeded again in a timely manner. I certainly hope the quality of your spring-threshed canola is better than what most suspect it may be.